This winter promises to be a wet one, with a massive and record El Niño promised by meteorologists. Goodness knows California needs it, given our multi-year drought. That's what makes moments like last year's April showers even more special--especially since I was actually in the park to capture some rainy evening photos. At the risk of moisture to my camera, I ran around trying to capture scenes accentuated by the reflective puddles. Naturally, Radiator Springs was one of my targets, and the results were certainly worth the trouble. With nary a person in sight but all the colors reflecting off the damp surfaces, I had quite my pick of compositions. Perhaps this winter will provide similarly soggy opportunities. 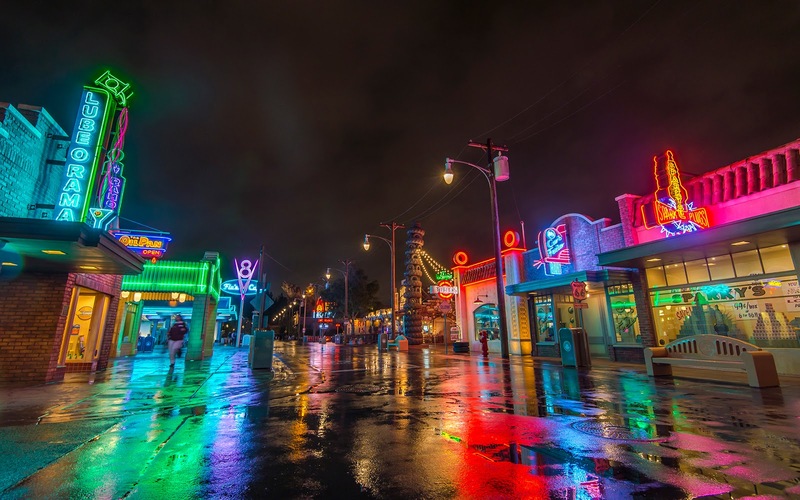 A rainy evening in Cars Land is one of the most luminously beautiful sights that the Disneyland Resort offers.